3CX is a Windows based software PBX that offers a vast assortment of customizable options and settings. This setup guide is intended to show the most basic configuration of the 3CX Phone System version 12.5. For more advanced configurations and features you can combine the basics detailed in this guide along with the 3CX documentation. Here we will configure the 3CX IP PBX through the web interface to properly route both incoming and outgoing calls to/from Callcentric. The information presented in this guide is based on Version 12.5.39117.982 (FREE Edition) of the 3CX software running on a Windows Server 2008 R2 x64 installation. Please note, if you are running a different software version (or a different software edition), some of the menu options and settings may be different. This guide assumes that you have installed the 3CX IP PBX and also that you have administrative access to the 3CX administration web interface. 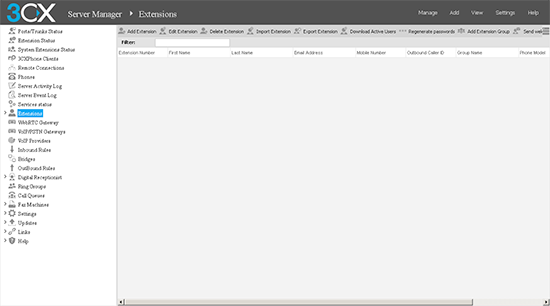 Log into the 3CX administrative interface and click on Extensions, from the left side of the page. Click the Add Extension link that is located at the top of the loaded page. 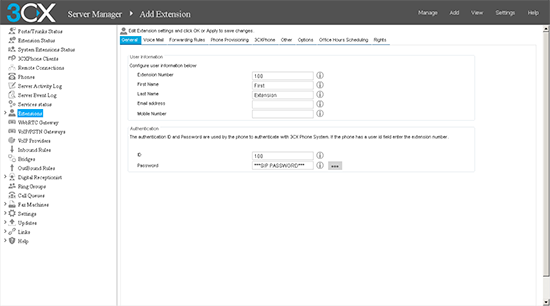 From the Add Extensions page, enter your Extension Number, Name, and a Password. Once you have entered your credentials for this extension, please click on the OK button to continue. 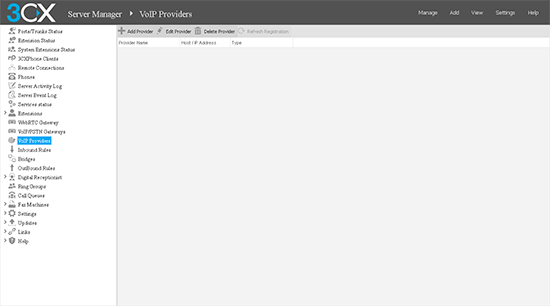 Next click on VOIP Providers from the left side of the page. Click the Add Provider link that is located on the top of the loaded page. 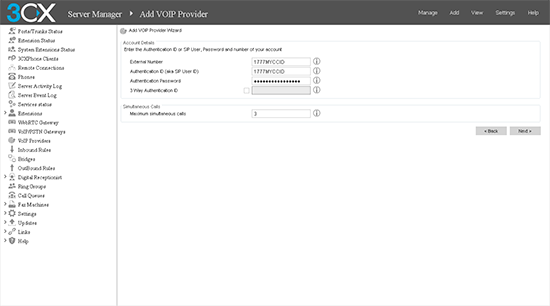 Once the Add VOIP Provider Wizard page loads enter "callcentric" in the Name Of Provider field, select US as the Country and then select Callcentric as the Provider. Once completed, please click the Next button to continue. 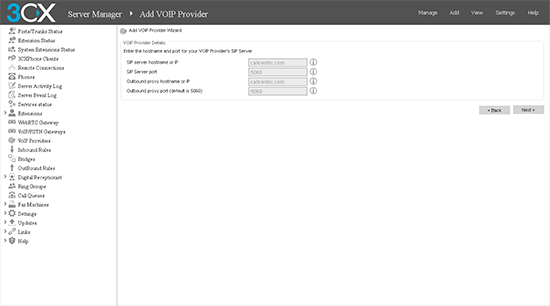 You will now be provided with the option to configure the servers that you will connect your system to. Please click Next as these settings have already been filled in as shown below. External Number: This is either the default extension 1777MYCCID OR 1777MYCCIDEXT, where 1777MYCCID is the 1777 number assigned to you by Callcentric and EXT is the three digit extension you are trying to register this UA to. Authentication ID: This is either the default extension 1777MYCCID OR 1777MYCCIDEXT, where 1777MYCCID is the 1777 number assigned to you by Callcentric and EXT is the three digit extension you are trying to register this UA to. Authentication Password: Enter your extension SIP Password here. Your extension SIP password is the password you created for the extension you are trying to use. You may edit the SIP password you wish to use in by logging into your My Callcentric account and clicking on the Extension menu link and then modifying the appropriate extension. You may then set the Maximum simultaneous calls value to 3. Only users who are sure of what they are doing should change this value. After you have completed this step, please click Next. 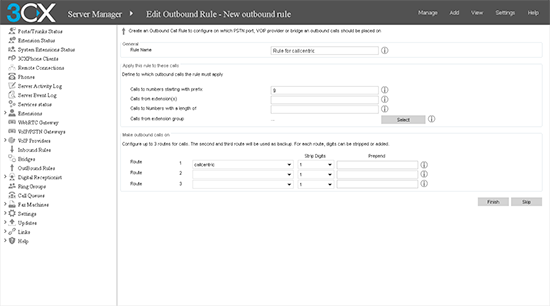 You will now be prompted to configure the inbound routing for your incoming calls. 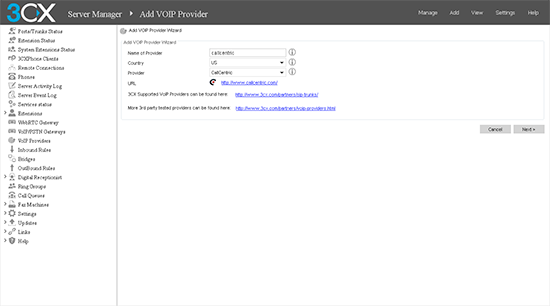 You may send incoming calls to any pre-configured location such an extension, IVR, etc... In this example, we will select the extension that you created in the earlier steps. Once completed, please click Next to continue configuring your 3CX system. 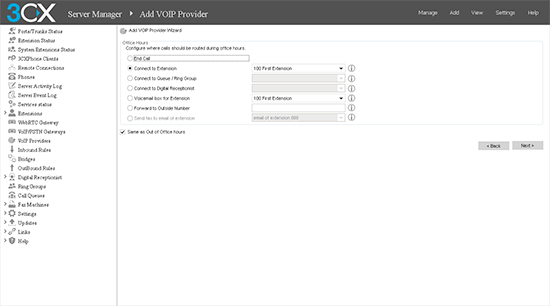 Next, you will be prompted to configure an Outbound Rule for the VoIP provider. To save your Outbound Rule and complete the basic setup of your system, please click the Finish button. 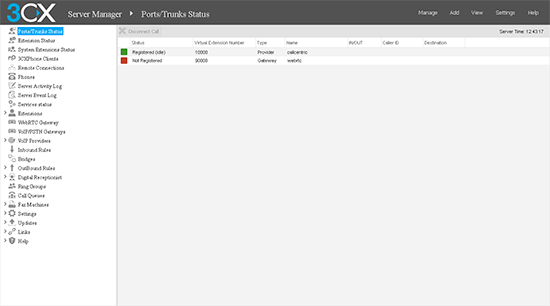 Once you have successfully configured your 3CX phone system, you can click on the Port/Trunk Status link located on the left side of the page to see if your PBX is properly registered. If there are problems with the Registration of your system, please review the logs to see the exact reason why your 3CX System is not registering properly to the Callcentric servers. Now that you are finished with the basic settings for your Callcentric Trunk, you can move on to configuring the advanced settings. 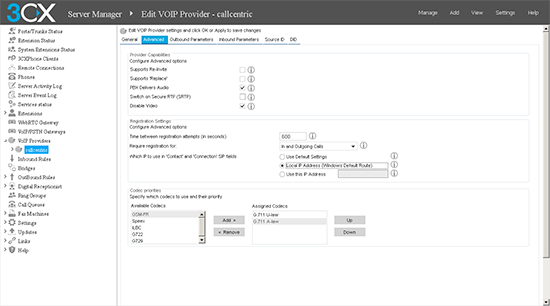 To configure the registration and codec settings on your Callcentric Trunk, please click on the VoIP Providers link that is located on the left side of the page and then select the Callcentric configuration. Next choose the Edit Provider option and then click the Advanced tab. Once completed, please click OK to save/apply your changes. After doing so, we would recommend that you double check the Port/Trunk Status to make sure that your registration continues to operate normally. That's it! Your 3CX (version 12.5) system should now be properly configured to work with the Callcentric services. Use the IP address or hostname for your 3CX phone system along with "100" (the extension created earlier which is the username) and the password for the 100 extension to connect to your 3CX phone system. Next you will want to try placing test calls to and from your 3CX phone system using the UA currently connected to your newly created extension (100). To test inbound calls from Callcentric to your 3CX installation, follow the directions listed in this FAQ.